The Department of Otorhinolaryngology at Montefiore Medical Center—one of the finest in the New York area—is dedicated to excellence in the diagnosis, treatment and research of diseases of the ear, nose and throat. We provide superior patient care from a multidisciplinary team of physicians, specialized surgeons, otologists, audiologists, physiologists and therapists who specialize in voice, speech and swallowing. Otolaryngology disorders often involve hearing, communication and appearance—all key to a person's identity and daily functioning. For each patient, a skilled team evaluates the problem and devises a comprehensive, individualized plan of treatment. We are committed to helping our patients achieve the best results while maintaining or regaining the highest level of ability possible. Our department uses the latest technologies and medical advancements to secure the best possible outcomes for our patients. Montefiore is a leader in the development and application of image-guided surgery and sophisticated surgical simulation technology. Montefiore diagnoses, treats, restores and rehabilitates a full range of problems, including hearing and balance disorders, facial nerve disorders and skull-based tumors. Our rhinology (nose surgery) services are second to none. We are experts in treating chronic sinusitis, nasal polyps, tumors of the nose, sinuses and nasal passages. The department's Speech-Swallow Pathology Program excels at treating speech, language, voice and swallowing disorders. Our Voice Laboratory applies the most innovative means to treat voice disorders like hoarseness, vocal cord damage, nodules and laryngeal tumors. In addition, Montefiore is preeminent at performing highly specialized cosmetic surgery, such as reconstructive procedures of the head and neck following tumor removal. 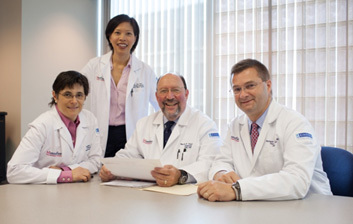 Our Head & Neck Cancer Program offers our patients the best in medical, radiation and surgical care. We use state-of-the-art diagnostic and management tools and offer a wide array of treatment options, all the while aiming to preserve function, speech and swallowing for our patients. The department's efforts extend into the area of clinical research. Montefiore is participating in prospective clinical trials and pioneering new minimally invasive surgical techniques that minimize facial incisions and complications for our patients. Our goal is to provide our patients with the highest caliber of treatment and care in the world. We are also leaders in pediatric otolaryngology. Montefiore specializes in treating children with significant airway problems, particularly those considered too high risk for other facilities to manage. These include children with multiple medical or disability concerns that can cause complications. Our work with deaf children from bilingual families has spawned research to learn how the brain reacts when a child regains hearing and encounters both English and Spanish at once.